This scroll depicts the buffalo-headed blue Yamantaka Vajrabhairava, the Death Tamer and Diamond Terrifier. With multiple heads, arms, and legs, he represents the fiercesome aspect of Manjusri, the bodhisattva of wisdom. In this powerful manifestation Yamantaka is shown with his blue consort, Vajravetali, in the father-mother embrace that symbolizes the perfect union of wisdom and compassion. A potent ring of flames encircles the couple, while animals and humans are shown beneath their feet. Yamanataka and his consort together represent victory over ignorance and death. Above are three benign representations of Buddhist beings: the Green Tara, who embodies the miraculous activities of all Buddhas and who helps overcome the obstacles to enlightenment; Manjusri, bodhisattva of wisdom, in the center; and Sadaksari Lokesvara, a four-armed form of the bodhisattva of compassion. 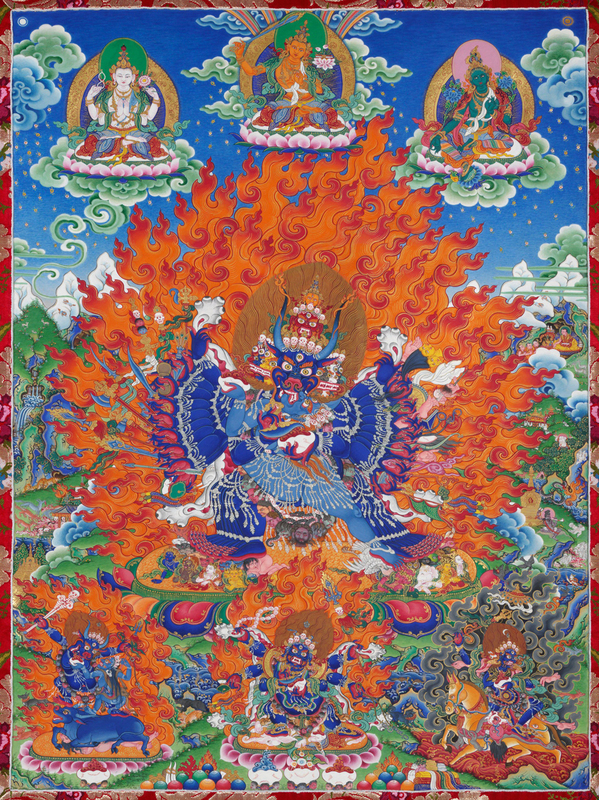 Below are three ferocious deities: Palden Lhamo, protector of the government of Tibet and Dalai Lamas, on the right; Mahakala, protector of Buddhism, in the center; and the Outer Yama Dharmaraja, who protects practitioners and monasteries from outside dangers and misfortunes. Kalsang Lodoe Oshoe comes from a prominent family of artists and serves as official court painter to the Dalai Lama. Kalsang spends part of each year working in Ithaca. The Johnson Museum commissioned this painting from him.